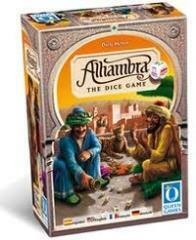 Compete with the other players in this smart game of dice to construct the legendary Alhambra. Employ your dice skillfully and finally emerge as the best master builder in this game. The remarkable thing about this game is: Although it is a game in its own right it can also be combined exceptionally well with the base game "Alhambra".